The terrific folks over at Ola! Granola generously sent us several packages (six, to be exact) of their Ola! O' So Natural Granola. Click onto the link above to see how the company was formed by a mom who just wanted a wholesome snack for her children. This granola comes in two distinct flavors: vanilla almond and cranberry orange pecan. We received three nine ounce bags of each. Laura and I couldn't wait to try them! THE VERDICT: This is not the kind of granola you may be used to if you think granola is filled with chocolate chips, pretzels and M&M's. This is real granola made with whole grain oats, whole wheat flour and wheat bran. The vanilla almond is flavored with pure maple syrup, canola oil, pure vanilla extract, cinnamon, sea salt and of course, almonds. The cranberry orange pecan is flavored with pecans, sweetened dried cranberries (cranberries, sugar) pure maple syrup, orange juice, canola oil, pure vanilla extract, cinnamon and sea salt. We recruited hubby to help us with our taste test. We pretty much all agreed that this was the kind of granola that needed to be added to something rather than just eaten out of bag. Because it's healthily "unsweetened", it can taste a bit bland right out of the package - like uncooked Quaker Oats. But put together with your favorite things, this granola is delicious. Laura added some to her ice cream (yeah, I know) and really enjoyed the nutty, fruity crunch it provided. I topped my yogurt with some (see pic) and it added a whole new dimension. I also made this great hot cereal by adding some skim milk to the granola and heating it in the microwave. It was so good and such a healthy breakfast. Hubby just munched his as a snack but wants to try it our way (as usual, lol). You could really taste the vanilla flavor in the vanilla almond. The pecans in the cranberry were HUGE and so good. This granola is the real deal. To find some in a shop near you, check out their cute website above. You can also order some online. 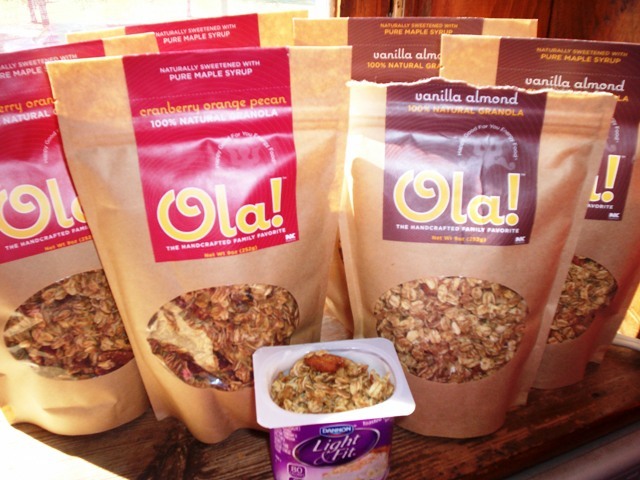 Be sure to try this granola if you have a chance. It can be a great tasty addition to your healthy lifestyle.